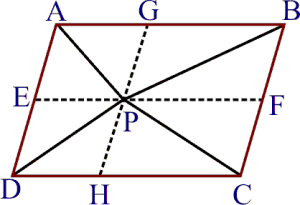 Q.1 In figure ABCD is a parallelogram, AE DC and CF AD. If AB = 16 cm, AE = 8 cm and CF = 10 cm, find AD. Sol. HGF and || gm HDCF stand on the same base HF and lie between the same parallels HF and DC. 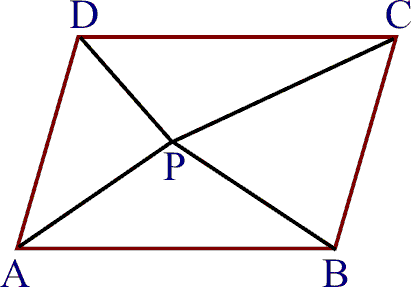 Q.3 P and Q are any two points lying on the sides DC and AD respectively of a parallelogram ABCD. Show that ar(APB) = ar(BQC). Sol. 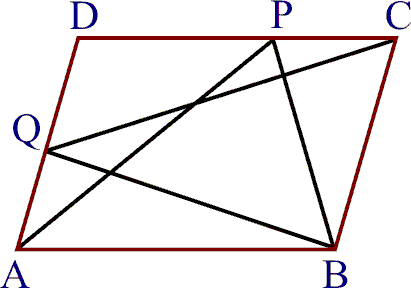 APB and || gm ABCD stand on the same base AB and lie between the same parallels AB and DC. Similarly , BQC and || gm ABCD stand on the same base BC and lie between the same parallels BC and AD. (ii) ar (APD) + ar(PBC) = ar (APB) + ar (PCD). Sol. 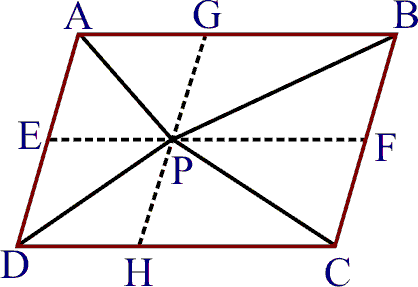 Draw EPF parallel to AB or DC and GPH parallel to AD or BC. 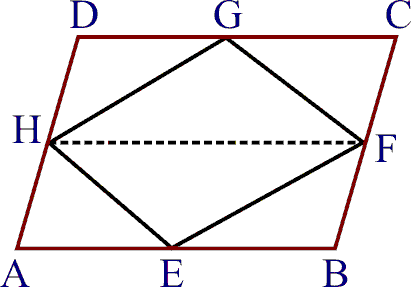 Similarly, HCBG, EFCD and ABFE are parallelograms. (i) APB and || gm ABFE stand on the same base AB and lie between the same parallels AB and EF. (ii) APD and || gm AGHD are on the same base AD and lie between the same parallels AD and HG. 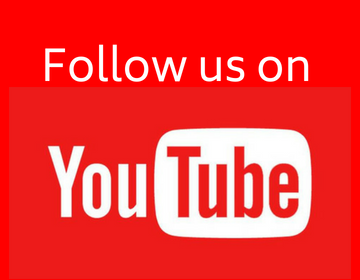 ar (APD) + ar (PBC) = ar (APB) + ar(PCD). (ii) ar (AXS) ar (PQRS). 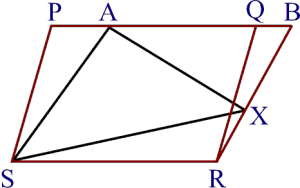 (i) || gm PQRS and || gm ABRS stand on the same base RS and lie between the same parallels SR and PAQB. (ii) AXS and || gm ABRS stand on the same base AS and lie between the same parallels AS and RB. 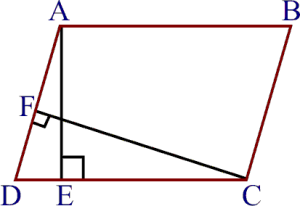 Q.6 A farmer was having a field in the form of a parallelogram PQRS. He took any point A on RS and joined it to points P and Q. In how many parts the fields is divided? What are the shapes of these parts? The farmer wants to sow wheat and pulses in equal portions of the field separately. How should he do it? Sol. Clearly, the field i.e., || gm PQRS is divided into 3 parts. Each part is of the shape of triangle. 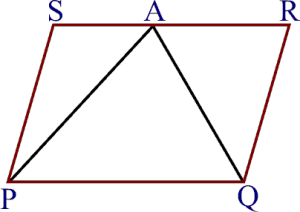 Since APQ and || gm PQRS stand on the same base PQ and lie between the same parallels PQ and SR. 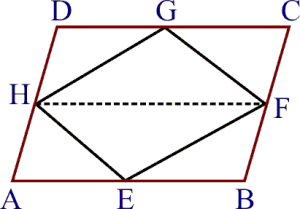 I'm a maths lover and here I've seen that these questions ncert CBSE pattern are very cool. I'm a maths lover and here I've seen that these questions of ncert CBSE pattern are very cool.